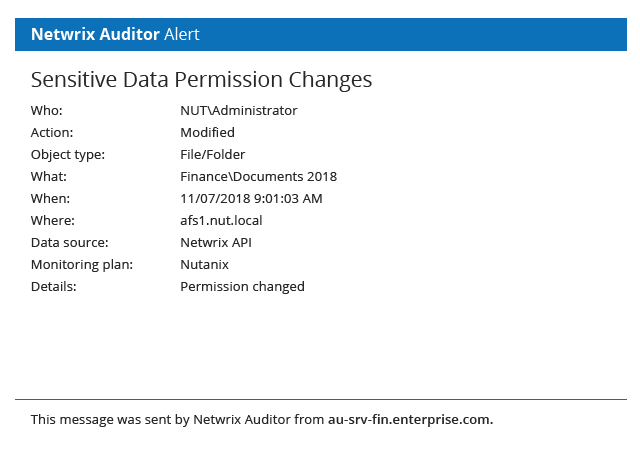 Netwrix Auditor for Nutanix Files (formerly known as Nutanix AFS) delivers actionable intelligence about what’s happening across Nutanix file servers. Get detailed information about changes to files, folders, shares and permissions; file reads; user permissions; the sensitive data you store; and file server space and usage, so you can reduce the risk of data leaks, ensure compliance and minimize business disruptions. Empowers you to protect sensitive data by showing the types of confidential information you have, where it’s located and who has access to it. Helps you identify actions that might threaten business-critical data by delivering information about changes to files, folders, shares and permissions, including the who, what, when and where details. 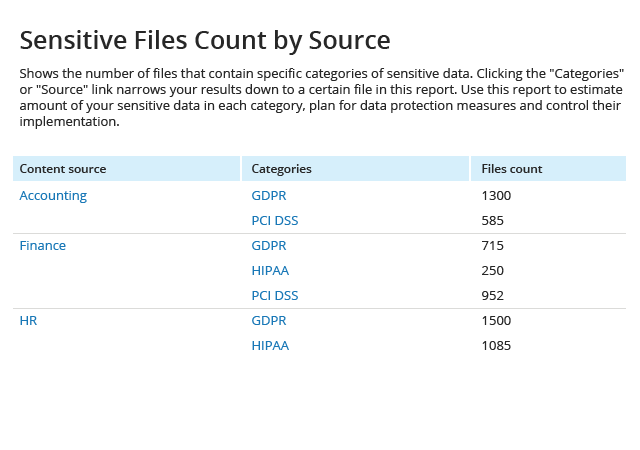 Reports on who viewed which files across your Nutanix file servers so you can ensure that no unauthorized or suspicious access to critical information goes unnoticed. Shows who has access to what data and enables you to spot overexposed data. You can also compare the current state of permissions to any moment in the past. Keeps you informed about the user activity you deem most critical, whether it’s massive removal of data from file server virtual machines or changes to user permissions. Provides details about data ownership, data usage and data volumes, and locates stale and duplicate files, so you can optimize space on your Nutanix file servers and improve your data management processes. Contains audit-ready reports mapped to common regulatory compliance standards that can be used to quickly prove to auditors that specific controls are in place. Pinpoints risks related to data security, such as file names that indicate they contain sensitive data or folders with permissions granted to everyone, so you can promptly remediate these risks before they result in data leaks. Makes it easy to efficiently investigate a security incident, such as unauthorized read access to customer data, or find the root cause of a user issue like the deletion of an important file from a folder. Speeds the investigation process by presenting key details about the user accounts involved in an incident in a single place. Allows you to embed custom scripts in alerts so you can ensure prompt response to common and anticipated incidents while staying focused on more important tasks. Collects audit data without the use of agents, so it doesn’t interfere with system processes or cause downtime. Without third-party tools, your organization’s chances of protecting the sensitive data it stores are extremely low and it won’t be easy to demonstrate clear evidence of your compliance to auditors. With software from Netwrix, you can easily build a cohesive data protection and compliance strategy while saving yourself hours of manual work. In order to protect your PII, PHI, PCI and IP, it’s crucial to know where it’s located and who has access to it. With data discovery and classification from Netwrix, you can regularly review this information to ensure that your sensitive data is not overexposed. All too often, critical events go unnoticed until the organization discovers a data leak, experiences downtime or fails to pass an audit check. Netwrix Auditor empowers you to quickly spot unauthorized Nutanix Files activity that undermines your security policy so you can respond in time to avoid data breaches, business disruptions and fines for noncompliance. Security incidents are inevitable. When they occur, Netwrix Auditor will help you reduce the mean time to respond by applying automated actions to anticipated incidents and facilitating faster, more accurate investigations. Plus, you can save your findings as custom reports or set up alerts to stay informed about similar activity in the future. 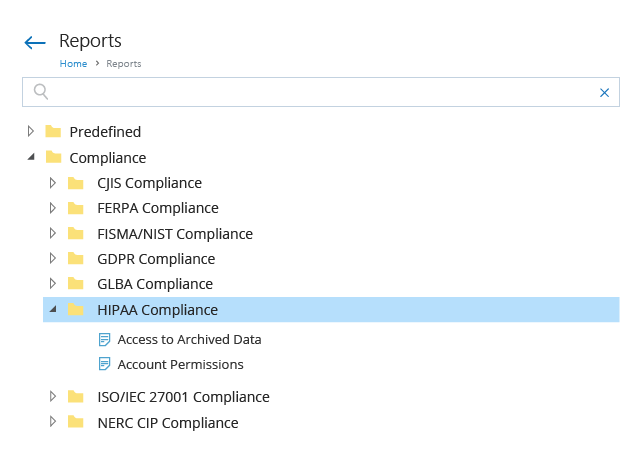 Easily prove your compliance with common standards like PCI DSS, HIPAA, GLBA and GDPR using ready-to-use intelligence provided by Netwrix Auditor. 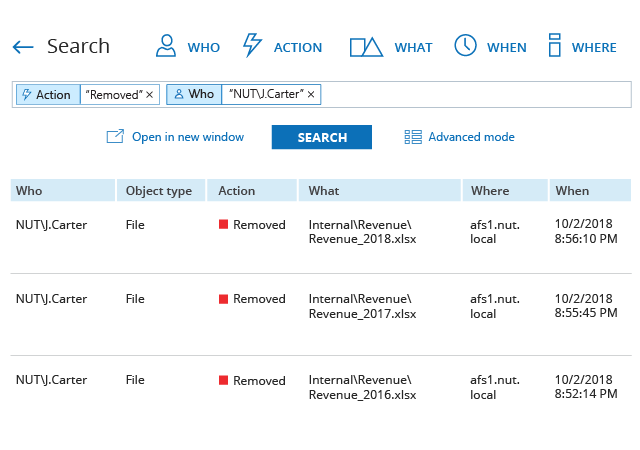 Quickly sort through the Nutanix Files audit trail whenever you need to pull up the requested information right on the spot. 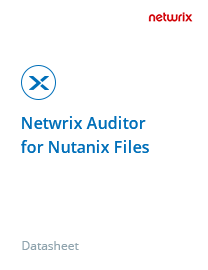 Find out how Netwrix Auditor for Nutanix Files helps organizations just like yours simplify Nutanix Files auditing and streamline regulatory compliance. Learn how data discovery and classification from Netwrix empowers organizations to locate critical data and secure it in accordance with its value or sensitivity. Day Pitney secures its proprietary and customer data and identifies and mitigates IT risks using Netwrix Auditor. Horizon Leisure Centres classifies its data to comply with the GDPR and ensure speedy response to subject access requests. Credissimo improves visibility across file servers and streamlines auditing processes with Netwrix Auditor.